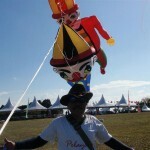 The first international kite festivals I went to- in the 1970’s (whoops showing my age a bit here)- were exciting events. We flew our kites with real passion back then- or maybe it just seems that we did because it was all so new for me. But I don’t think so. There was a sense that we were starting something that was going to get better and better for ever. Steerable kites, starting with Peter Powells and similar, were in a surge of development that soon led to the delta style stunt/sports kite and the entire team flying phenomonen. Ray Merry and Andrew Jones’s Flexifoil power kite had just burst onto the scene, followed by an array of other two and then four line power kites for dragging, jumping and the first steps towards traction kiting. And Jalbert’s ram air principle jumped the species barrier from his original parafoil style. Single line kite shapes that had previously not even been dreamed of began to hit the sky (and frequently the ground). Before the ‘70’s kite flying events were generally just kite days for kids at the local park or beach. By the end of the ‘80’s, there were enough international kite festivals to keep dedicated adult kite fliers fully engaged earning frequent flier miles (if only there had been any back then). 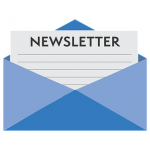 But by the turn of the millenium, kite events seemed to stall a bit when, for a while, not enough bigger, better, brighter things came along to hold the fickle public’s attention and keep kite flier’s enthusiastic. Power kiters became as bored with being dragged across the grass as the spectators who watched them – so developed kite traction and went off to do their own things: Kite buggying, ski-kiting and kite boarding (land and water), generally at places where festivals aren’t. And small framed kites, no matter how exquisitely formed or excellently they fly (and some truly are close to perfection) failed to hold wide public appeal; partly because the public are too far away to be able to appreciate their finer details and partly because ‘art ‘ kites like all arty stuff are an elitist in-group thing, difficult to sell to a wide audience even with the special featuring they get at events like Bristol and Cervia. Like for more extreme trick flying; when it’s difficult even for another kite flier to tell whether something’s an amateur botch-up or very clever, it’s a pretty sure bet that we won’t have kept the public with us. Most kite fliers, myself included, believe that kites should be valued for characteristics other than just size, but the public take notice of size (and crashes) first, then shape, colour, and movement. Workmanship and artistic nuance impress the kite watching public hardly at all- and their views matter because it’s their money that sponsors our activity. So why not just make framed kites bigger? Unfortunately this is not possible: For the same reason that elephants aren’t into high jumping. Area scales with the dimension squared, weight with dimension cubed. Large framed kites that are strong enough not to break are too heavy to fly. 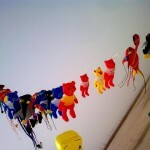 One element of kite festivals that has proven to be enduring and successful though, is kite making workshops. The people who make kites with kids and can keep on smiling while endlessly answering the same questions and correcting the same mistakes, are our unsung heroes (along with event organisers). And we are now on a roll again I reckon- because of continuing contributions from all the above (and especially the workshop people) and because Jalbert’s children have grown up and taken over the world (of kite festival flying that is). 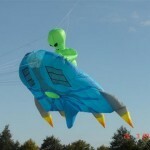 Large soft theme kites have become indispensible, the essential heart of any serious public-attracting kite event. In large part this has been enabled by the use of various styles of lifter or pilot kites: Some purists still don’t regard kites that use lifters as proper kites, but the public doesn’t give a toss about this nicety; just likes to see the sky filled with big colourful kites of recognisable form (and a few crashes). 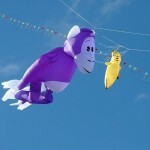 I expect it would now be difficult to organise a successful kite event without at least a few of this style of kite. Filling the sky with them seems to have re-established the momentum that was in danger of faltering. It’s a trend that is being supported by an explosion of variety in this kite style, which is happening, I believe, because of the burgeoning use of pilot kites and the increasingly common practise of flying in trains. Now that they mainly don’t have to fly by themselves, designing and building new styles of large soft kites has become so easy that it’s been taken up enthusiastically by people from almost every country. But even large soft show kites have come up against a barrier at all but the largest festival sites. Pasir Gudang this year was a nightmare event for large kite fliers: Seven strings (of up to five maxi kites each) were crammed into less than 100m’s of cross wind space- in sometimes unuseable wind. On one day, the longest period of uninterrupted flying I had with my string was nine minutes, the next longest six minutes and for the remainder of the time, pull-downs and re-launches were continuous. Of course, we could have reduced the number of kites flying- but in my view at least, our job as fliers is to keep as many kites in the air as possible- this is what the public come to see (and what their agents, the event organisers work to make happen). It’s not part of this deal that I should be able to sit on my chuff while the kites fly themselves (though I sure do appreciate this when it happens). Another suggestion (from the European contingent) was that the event organisers should have stepped in and mandated, say, just four strings (spaced widely enough to reduce tangling to a more acceptable level), each string with 10 kites or more, contributed by various fliers. A rather authoritarian solution I rather thought at the time- typically European even. But actually it wouldn’t have been necessary for the organisers to impose this- we kitefliers could have (and should have I think) done this on our own initiative- and the cooperation between large kite fliers is easily up to this now- it’s at least 10 years since I’ve seen knives pulled in anger on a kite field. Unfortunately by the time this solution had developed legs, the event was running down- but next time! Such an approach solves the space problem by packing more kites into less sky- – the Al farsi’s 20 maxi kites on one string could become s.o.p. But anchors will have to be commensurately secure, and although problems will happen less often, they’ll be much bigger when they do. There’ll be excellent photo opp’s when adjacent 20 kite maxi trains get over-friendly, and this many large animals making a break for freedom could easily lead to an entirely new theme series for Marvel Comics. I might try a few new shapes out, but plenty of other people have great soft kite ideas now, so I’m concentrating on making better pilot kites. Their performance has become such a critical element in getting more big kites reliably stacked into a given space, especially when the wind is less than ideal, (which is almost always). An interesting and engaging challenge, which I’d have a lot more time for if there weren’t now so many really excellent kite festivals to go to!